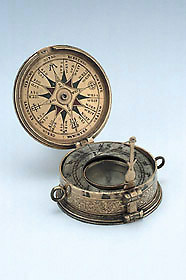 This compendium contains a lunar volvelle, an inclining string gnomon sundial, along with a table of latitudes to aid in its use, a compass, a nocturnal and an attractively coloured wind rose and compass rose. The instrument is unsigned but has been attributed to Christoph Schissler, partly because it features acid-etched decoration, a characteristic feature on several instruments by Schissler. However, the style of both etched and engraved decoration as well as the form of several elements of the compendium do not closely match signed Schissler instruments, and the attribution does not appear a secure one.